Here are some pictures of parts from my engine. Would any of you be able to identify a make/model for these? Finally there is this part, which reside in front on my fuel injection pump. The little pipe at the top is oil line. I have no clue what is this part? May anyone makes my education? What engine is it? With that known, we can point you to a source for knowledge of the parts. Brand: Acadia (from Bridgewater, Nova Scotia). Model: AD30 straight 6cyl naturally aspirated diesel. It is based on an Hercules D298 or D3000 block. I have been told the fuel pump is a roosa master pump (if anyone can give me knowledge of it?) but I am pretty sure the raw water pump is not the original. The raw water pump looks like a Mercury/Mercruiser raw water pump from for 8.2L V-Belt applications 1996 and earlier. It has also been used on late style MerCruiser 4.3L, 5.0L, 5.7L, 7.4L and 8.2L, but with a serpentine pulley. 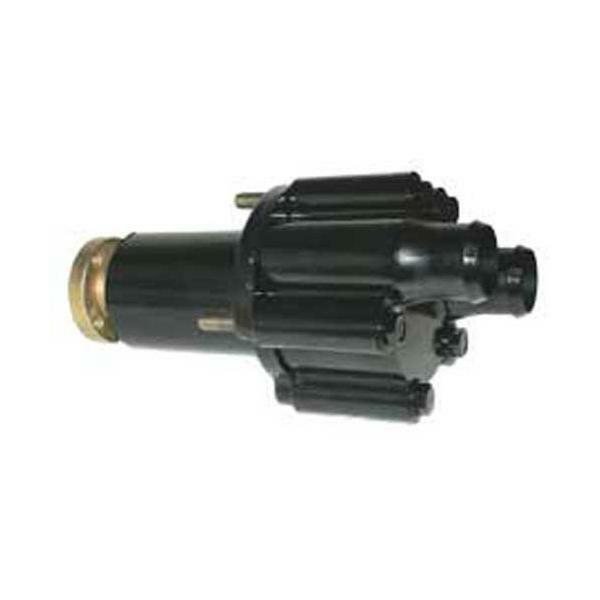 The Mercruiser part number is 46-807151A12. There were some variants of this though so check the end plate for identification numbers. Sierra also has an aftermarket pump for that application. Thank you LarryM I will check in that direction. If any body ele has info, step in. It looks in the first picture like there is a bare connection on the white wire of that fuse holder. This is not a fuse holder but an automotive type waterproof connector that connects to one of my water temp sender. The bare part on the white wire is connected to the sender itself (don't know the technical name of this type of connector, a female cylinder that you push on a pin), I want to change it with a ring and bolt but do not have the correct size aboard, will do it when I get back home. I'd venture that the last picture is an extension of the timing case and an unused PTO pad. The brightest part on the left is the alternator pulley with the belt moving it. What I do not understand is the red part with black dirt (yeah I will clean this) on it and the oil pipe to lubricate it. As it is in front of the fuel injection pump I do not see its use? Would any of you be able to identify a make/model for these? Lou, I know it's past your bed time but when you are next up, if you can't get the answer, see if you can roust Charlie Arcon in Shelburne NS, he just might be able to help or steer you. PHONE: nine zero two-eight seven five-one two seven six. Be prepared for a long conversation though. If that doesn't get him I can PM his email. PTO = Power Take-Off (for example, to connect a smaller drive shaft on that end, to power something else with the same engine, such as a pump. More common to use the PTO on a farm tractor or maybe a fire truck, etc. but I'm sure that engine was designed to fit many applications besides marine propulsion. Thank you for the clarification Indeed this engine was originally made to fulfill different needs like army trucks, farm tractor and water pump so looks like this unknown part could be a PTO, and looking at it it makes sense. Mr. L_t. If that unknown part IS a PTO, think of the possibilities...Hydraulic pump for: Bow and/or stern thrusters, anchor windlass, satellite TV power antenna...The options are endless. More stuff to spend money on and way more things to go wrong or for the yard to screw up. So, what's stopping you? LOL! Well for now I will fix what is wrong and then I will think to add more point of failure . I did a bit of digging on my injection pump, that is a roosa master / stanadyne one. I still have to find the exact model but at least I think I found where is the plate showing it so I will check this afternoon when I will be back to the boat. About the part that looked to be a PTO, well it is. In fact the roosa master pump is connected to it and looking at the pump construction it is obvious that this part connect to the pump shaft to power it (mechanically speaking). Also it looks like the pump has been a bit modified from the original. For example, a solenoid has been mounted in place of the manual shutoff cable (which is nice).